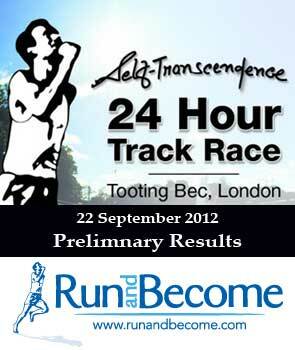 The 2012 Self-Transcendence 24 Hour Race Tooting Bec in South London began as it usually does at 12 noon Saturday afternoon with 45 runners. The field this year was predominantly British and included a higher percentage of debutants at this distance. The weather was dry and not too windy with bright sunshine for the first quarter and Rasmivan Collinson led for the first three hours or so. Helen James and Heather- Foundling Hawker worked hard at the front for the women before Heather retired with stomach issues and the running for the top spot for the rest of the race was between New Zealander Antonia Johnson and Helen James. Robbie Britton, who came fifth in the Self-Transcendence race in Basle in May with 222.578 km, Robin Gardner and Kevin Doyle ran well but in the last quarter Doyle found another gear to up the tempo and maintain good pace to overcome Robbie Britten to take the win with 217 km. Helen James persisted and was first lady 6th overall. The amazing Geoff Oliver aged 79 put in another awesome performance finishing with 167.586 km (104.13 miles). Shankara Smith has maintained the standards put in place by her father Ongkar Tony Smith who created the race in 1989 and continues as the premier 24 hour track race in the UK and this year is the only such event. Photos and full results will be available on the race website: Sri Chinmoy A.C.